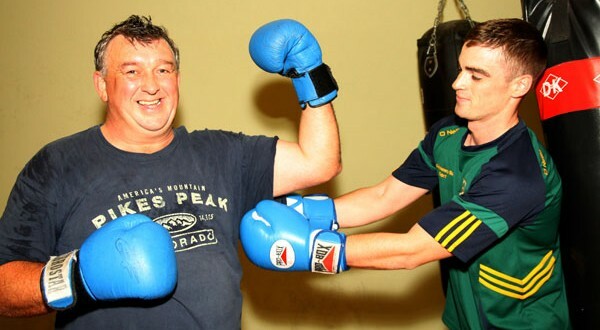 Gort Rugby Club president, Tom Finneran and Gort senior hurler Greg Lally in training for Saturday night’s White Collar Boxing event. THIS weekend, 22 of South Galway’s best-known rugby and GAA personalities will go toe-to-toe in a different discipline to raise money for Gort RFC and Southern Gaels Gaelic Football Club. Hundreds of people are expected to turn out to support the 20 men and two women when they step onto the canvas in Sullivan’s Hotel on Saturday night for the White Collar Boxing event. “We have been getting a really good response so far. People are really looking forward to the event. We have had lots of interest on Facebook and have already got more than 1,200 friends on there. We have the potential to hold 1,000 people and we would be expecting at least 600 to 700,” outlined Ronnie Giblin, one of the event organisers. All proceeds from the night will go to Gort Rugby Club, which covers South Galway and North Clare and Southern Gaels Gaelic Football Club, which includes the parishes of Ballindereen, Beagh, Kinvara, Gort and Kilbeacanty. “Last year, champion jockey Derek O’Connor ran a white collar boxing event, along with a few of his jockey friends and it was a wonderful night and people are still talking about it. “We felt there was a demand to make it an annual event so we approached Derek and his wife, Carol. They had just got married during the summer so they decided not to do it this year but gave it their blessing,” Ronnie explained. Taking part in fight night has taken a major commitment with preparation for the fundraiser beginning at the end of the summer. “There are 11 fights, so that is 22 fighters, made up of 10 male bouts and one female. All of the training has been done by Tobar Pheadar Boxing Club based in Shanaglish. “Their team has been a huge help and they will do the judging on the night and James Fahy will referee. We had no trouble getting volunteers. I think we let people know in good time and training then started in August. “We got a great response from people and the only difficulty really came when people had to be paired off into suitable weight divisions but Tobar Pheadar took care of that and it seems to have worked out quite well,” Ronnie outlined. As well as the interest and support of volunteers, participants, club members and the wider community, local businesses have had a major part to play in ensuring Saturday night’s event is a success. “We have a fantastic programme for the event with lots of well-known people from the area taking part. We have a mix of ages and lots of characters and we have a lot of sponsors too. This would not have been possible without them. There has been huge support locally,” Ronnie said. “Our big fight and the last on the night is between two well-known hurlers, Greg Lally and Tadhg Linnane, both of whom played for Gort and for Galway in the past. We have lots of footballers and rugby players and local business people taking part. The ladies are Shauna Burke from Craughwell, who is taking on Maggie Glynn from Kilbeacanty,” he added. According to Ronnie, the evening promises to be very entertaining and will benefit local organisations. “This is for the two local clubs, Southern Gaels Gaelic club and Gort Rugby Club, which covers all of South Galway and parts of North Clare, including Tubber and Boston. We are using this event to specifically raise money to develop the underage elements of both clubs, to get the U-10s and U-12s out playing sport. In Southern Gaels for example, it has only been going for about two years and it has three adult teams. However, the underage needs support and that is what this money is for and we need to make sure there is underage talent coming through,” he said. Proceedings get underway at 7.30pm. MC is head of sport at Galway Bay FM Ollie Turner. Tickets are available at Sullivan’s reception, from club members and there will be a limited supply at the door.